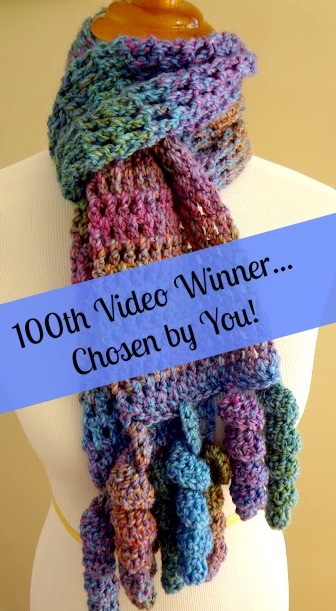 Fiber Flux: 100th Video Celebration! I am tickled pink to share my 100th video you today, I really appreciate all of your votes and kind comments, you all are the best! After all of your votes were tallied up, the Celebration Scarf won! In fact, it was by a landslide. For those of you who voted for the Party Cake Dishcloths, not to worry, there will be a video for that too. Here is the link to the printable written pattern if you'd like that too. Just scroll to the bottom and click the green "print friendly" button. Without further ado, click below for the Celebration Scarf instructional video!!! Yay ! Congrats on your 100th video ! I adore your scarf, it's on my must make list !